I made gumbo for the first time a couple of month’s ago for Fat Tuesday. We liked it, but everyone except my oldest son thought the okra was too slimy. So for this challenge I decided to make a Southwestern Gumbo. I was inspired by Kamal and Sheila’s Southwestern Gumbo. I used the challenge recipe to create the roux – a great base for any soup really. Then I changed up the spices a bit and added tomatoes, black beans and corn. While far from a traditional gumbo, this is a delicious, flavorful, rib-sticking one dish meal. In a large cast-iron or heavy-bottomed pan, brown chorizo, remove from pan and heat canola oil over high heat. Whisk the flour into the hot oil–it will start to sizzle. Reduce the heat to moderate, and continue whisking until the roux becomes deep brown in color, about 15 minutes. Add chorizo and remaining ingredients and bring the gumbo to a boil, stirring occasionally. Reduce the heat to medium-low and simmer, uncovered, for 45 minutes. *Use Rotel Mild if you don’t like food too spicy. Visit the Daring Kitchen for this month’s challenge recipe and to see all the fabulous gumbos the Daring Cooks whipped up this month. Thanks Denise for a terrific challenge. 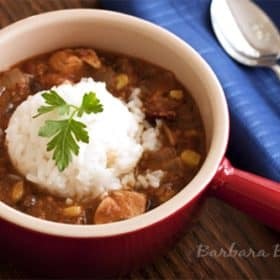 I am loving all of these different gumbo recipes – it would hit the spot on a bleak day like it is here today. Love the gumbo that served with rice! Looks so flavourful. 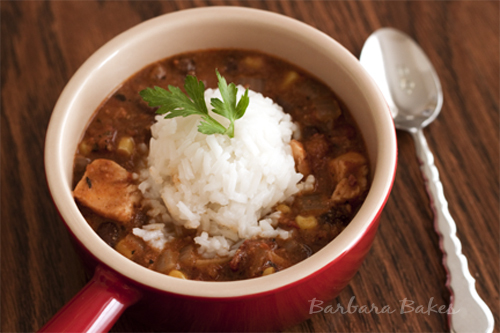 I’m loving your version of gumbo….we love southwest flavors so I’m bookmarking this recipe. Thanks Barbara! I adore corn and black beans they are a great addition to the gumbo and the colour of the liquid is marvellous well done and the photograph is stunning. I love the idea of gumbo with southwestern flavors! I love the Southwestern twist. We’re big fans of those flavors at our house, so I’m adding this to the recipe list. Thanks! Who would have guessed how good this would look on May 14th…but as I sit here with a chill in our not unexpected but always forget anyhow last breath of winter in Colorado…I wish I had some. Sounds delicious, Barbara. I love recipes that are so adaptable to almost anything. Mine was a true case of versatility, and still was to die for. Love your plating and your beautiful shots. What a great twist on gumbo! Would you believe I’ve never had it? I’m bookmarking this though, since it looks delicious! I have never had this but it looks and sounds very hearty and delicious. 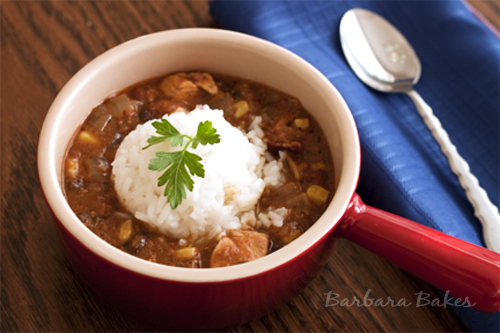 Yum – southwest gumbo sounds delicious, and yours looks fantastic!! Really great job on the challenge!! That is great that you were able to adapt the challenge to suit your family’s tastes in such a delicious way!! Barbara i love your version. I did not go the traditional route either as I am just not a huge fan though I did use okra and used fresh, adding it in at the very last minute and keeping it crispy and it fortuantely did not go slimy! I have printed out this recipe so I can make it next time – great flavours! A great challenge! That gumbo must be tasty and very enjoyable.